Chris O'Donnell, Alfred Molina, Michael Keaton et al. Even when it was east versus West, sometimes it was hard to tell the good guys from the bad. 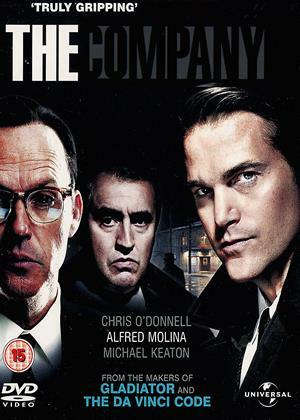 "The Company" is a pulse-pounding rollercoaster ride that traces the CIA's secret war against the KGB, spanning the globe from Moscow to Berlin, from Budapest to London, from Washington D.C. to Cuba. Sent to Berlin to work with a man who becomes his mentor, codename "The Sorcerer" (Alfred Molina), Jack McCauliffe (Chris O'Donnell) soon finds himself caught up in a web of intrigue and deceit as he takes on his elusive and formidable enemy. And when Jack falls in love with an informant, codename "Rainbow" (Alexandra Maria Lara), this simple act makes her a pawn in their terrible game. But there is a traitor somewhere in the CIA, feeding vital information to the enemy, sabotage and death to the very heart of 'the company'. Together with their counter intelligence Chief, James Angleton (Michael Keaton), McCauliffe and "The Sorcerer" must find this mole before the world that they have fought so hard to preserve is completely destroyed.